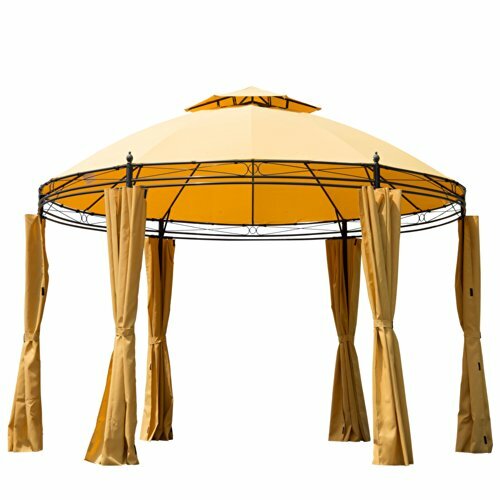 Enjoy the beautiful weather in the comfort of your own backyard this summer with the round Outsunny gazebo tent. Made of powder coated steel this gazebo will provide you with the optimal amount of shade so you can sit outside without getting sunburnt. If the weather gets a little colder or there are too many bugs you can shut the polyester walls to keep the inside insulated and the bugs out. The stylish orange fabric fits with most backyard decors because it adds a neutral color that can accentuate without overpowering your other patio furniture. Give your backyard patio a makeover with this stylish and versatile Outsunny gazebo tent. Features: -Dome shaped roof to prevent water from pooling -Sturdy powder coated steel frame gives strong support -Double roof design allows excellent ventilation for those hot days -Close the walls to keep out bugs or wind -Hook and loop fasteners to keep walls connected or detach them for a more open feel -Stylish design fits with almost any backyard decor -Assembly required but all necessary hardware included Specifications: -Color: Orange -Top materials: 180 gram PA-coated polyester fabric -Side curtain: 160 gram polyester fabric -Frame materials: powder coated steel -Dimensions: 11 1/2'D x 7'/9'H -Big hook and loop fasteners on each steel post -Product weight: 72.7 lbs -Ground stakes included".